After a yearlong highly crafted campaign of viral marketing, the much-hyped J.J. Abrams-produced Cloverfield arrived in movie theaters. The result is a film experience that is familiar, wrapped in proven Hollywood convention and also innovative and genre twisting. Cloverfield is essentially a Godzilla movie without Godzilla. After the dismal 1998 Roland Emmerich Americanized adaption who can blame the franchiseâ€™s owners wanting their Gojira copyright to remain in Japan. To be more accurate, Cloverfield is a classic 1950â€™s era rampaging monster movie very much in the tradition of the great B-movies like The Blob, Them!, The Beast from 20,000 Fathoms and Tarantula. It is dressed in 21st Century clothes. The classic monster movies of the â€™50 tapped into Americansâ€™ collective fears of Communism and nuclear war; fueled by that generationsâ€™ anxiety that a malevolent Other will attack and wipe the U.S., freedom and consumer-driven democracy from the face of Earth, with unchecked scientific advancement often an unwitting accomplice. Cloverfield taps present-day Americansâ€™ collective xenophobia that malevolent foreign forces they donâ€™t understand and cannot reason with are poised to descend on them and wipe the U.S., freedom and consumer-driven democracy from the face of the Earth. Images of debris clouds and a devastated New York City skyline evoke the terror attacks of 9/11 all too clearly. In case anyone in the theatre had any doubts, Cloverfield punctuates its understanding of Americansâ€™ internalize 9/11 wounds by loping off the head of the Statue of Liberty. An ineffective military bravely and courageously unleash everything in their arsenal at the beast, but really they are clueless as to what the creature is or where to came from or how to combat it. IEDs are replaced in the film by vicious â€œfliesâ€ or baby monsters that overrun ground troops and innocent bystanders. 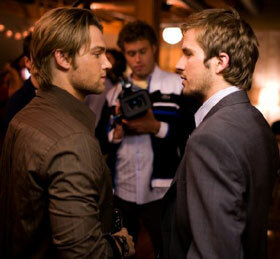 The filmâ€™s characters spend the movie equally clueless as to the origins of the monster and its intent. These subliminal horrors are as potent and present in filmgoersâ€™ minds today as the Red Scare was interwoven into filmgoer consciousness in the â€™50. 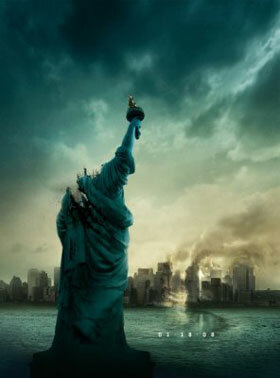 Cloverfield may also be described as The Blair Witch Project Meets Godzilla. Playing out the drama from the first person view through a camcorder or film camera is not new. Like Blair Witch, Cloverfield chooses to make its extreme cinema verite the entire movie and all filmgoers know is what the character holding the camera sees and experiences in the filmâ€™s contrived â€œreal-time.â€ The difference between Cloverfield and Blair Witch and how this camera -narrative approach has previously been used is that Cloverfield simultaneously taps into the current emergent culture shaped by YouTube and a generationsâ€™ access to high-quality consumer video technology. In the few years since Blair Witch premiered, families have grown up in front of the camcorder, video clips are snapped off on mobile phones and no one thinks twice about capturing any mundane moment to share with the world whether anyone cares or not (and we do it all the time). First person experience is the new entertainment. Cloverfield may be the first major studio movie to successfully take current Internet sensibilities and commit them dramatically to film. It is likely not the last instance in which a major studio production mimics the type of filmmaking experience for dramatic affect that people do for themselves. Am I completely happy with Cloverfield as film? No. Do I want to sit through 85 minutes of shaky camera work? Letâ€™s say thank God it is not Blair Witch. Could the third act have been stronger? Maybe.